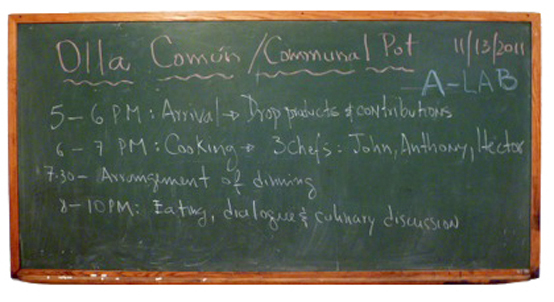 Olla Común / Communal Pot is a seasonal gathering celebration in which A-Lab members, participants, guest artists, and the public come together to prepare a meal(s), share information, and engage in dialogue about cooperation, economies of scale, and civil engagement. As part of the Shifting Communities Roundtable Series, OLLA COMÚN explores notions of food sourcing, gleaning, and meal sharing through a gastronomic cooking and dining experience that developed throughout the course of one evening. The program included a performance by John Cichon and Hector Canonge, with guest artist Anthony Gonzales, communal cooking, dining and challenging conversations. A-Lab is an artists’ collective initiated by interdisciplinary artist, Hector Canonge. From its inception in 2009, A-Lab's mission has been to promote and forge stronger collaborative projects for artists working and/or living in NYC. A-Lab is an independent initiative whose mission is to inform and assist artists in various aspects of their development. A-Lab's monthly meetings have been designed as a collaborative effort among artists to share resources, know-how, and experience to compete in the market place. In addition, A-Lab highly encourages and supports social activities to take place in local businesses and institutions in New York City. The convergence of the Arts and Community Building is another important component of the A-Lab as members can propose performances, shows, music gatherings, poetry readings, projections, public interventions, and more, in and around the various boroughs.